Sigalit Landau, Barbed Hula. Exhibition view. Venice International Performance Art Week (2014). Photograph by Samanta Cinquini. Born 1969 in Jerusalem, Sigalit Landau is an interdisciplinary Israeli artist working in sculpture, video and installation. She considers her work as a bridge maker. [Un]consciously looking for new and vital materials to connect the past to the future, the west to the east, the private with the collective, the sub-existential to the Uber-profound, the found objects to the deepest epic narratives and mythologies. Using scattered, broken words to define "the-bricker-brack" and transform it into a soft heap of new dream-buds, to act upon the uncertain horizon. 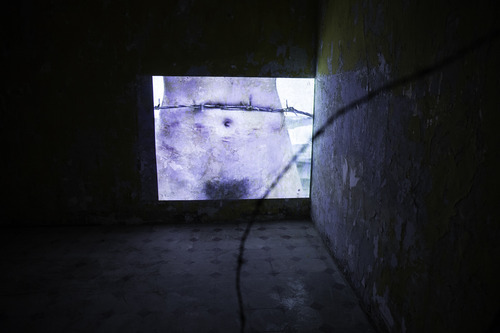 The VENICE INTERNATIONAL PERFORMANCE ART WEEK 2014 shows the video art work Barbed Hula (1999). The artist performed this act of desensitization - spinning a hula hoop of barbed wire - at sunrise on a southern beach of Tel Aviv, where fishermen and old people come to start their day and exercise. The beach is the only calm and natural border Israel has. Danger is generated from history into life and into the body. In this video loop she is performing a hula belly dance. This is a personal and senso-political act concerned with invisible, sub-skin borders, surrounding the body actively and endlessly. All of Landau’s work relates, in one way or another, to a loss of orientation. The pain here is escaped by the speed of the act, and the fact that the spikes of the barbed wire are mostly turned outwards.